नवकंज लोचन, कंजमुख कर, कंज पद कंजारुणं. Oh Mind, worship Shri Ramachandra who removes the fear of birth, death and other perils. The Lords eyes, face, hands and legs are like freshly blossomed lotus. पट पीत मानहु तडित रूचि-शुची नौमी, जनक सुतावरं. 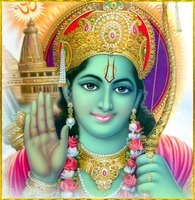 Oh Mind, worship Shri Ramachandra whose beauty is unparallel to countless cupids. Whose body is like blue hued cloud. Whose garb gleams like lightning, the one who is married to the daughter of King Janaka. रघुनंद आनंद कंद कोशल चन्द्र दशरथ नंदनम. Oh Mind, worship Shri Ramachandra whose is the upholder of the poor, Lord of the day light, the one who vanquished the demonic races. 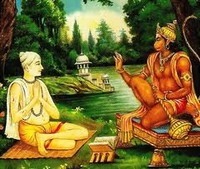 He is the progency of Raghu, limitless joy, moon of Queen Koushalya and the dearest to King Dasaratha. आजानुभुज शर चाप-धर, संग्राम-जित-खर दूषणं. Oh Mind, worship Shri Ramachandra who wears a crown, adorned with ear rings, with thilak on his forehead and who is decorated with ornaments. His arms extend to the knees, who bears a bow and arrow and defeated Khara and Dhushana in the battle. मम ह्रदय कंज निवास कुरु, कामादि खल-दल-गंजनं. Tulsidas proclaims, O! Lord Ramachandra, you have filled the hearts of Lord Shiva, Adisesha and Saints with bliss. Please reside in my heart and expurgate the inferior feelings of impurities like ‘kama’ craving desire, ‘krodha’ anger, ‘lobha’ greed, ‘moha’ obsession, madha ‘conceit’ and matsaryam ‘jealousy’.